A few years ago, Israeli producers started to make serious inroads into the US market with local adaptations of their dramas. Exemplified by shows like In Treatment, Traffic Light and Homeland, we looked at this trend in a column in June 2015. Subsequently, Israel has also started to have notable successes in other parts of the world. 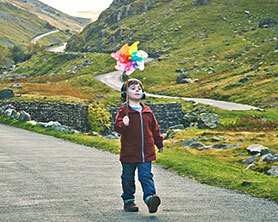 A good example is Keshet International (KI)’s The A Word, a comedy drama adapted by the BBC in the UK. Having secured strong ratings in BBC1 primetime, the show has now been recommissioned for a second season and is being adapted for the Greek market. It has also been licensed to broadcasters including Sundance in the US, CBC (Canada), BBC First (Australia) and, ironically perhaps, pay TV broadcaster YES in Israel. It’s not just Israeli adaptations that are winning over buyers. Original Hebrew-language dramas have also started to generate interest. In October 2015, for example, Fox International Channels acquired KI drama False Flag – the first time it had bought a non-English-language scripted series for use on a global scale. Federation Entertainment and Armoza Formats, meanwhile, have had a lot of joy selling Hebrew-language series Hostages internationally, and there is also an English-language version of the show. Additionally, Endemol Shine International recently sold Israeli thriller Mossad to Turner Latin America. This week, there was another positive development for Hebrew-language drama, with the news that Channel 4 in the UK is to air Endemol’s Israel-produced comedy-drama The Baker and the Beauty – the first time C4 has ever aired an Israeli drama in its original form. The show, distributed by KI, was picked up earlier this year for use on the C4-backed foreign-language VOD service Walter Presents. But airing on C4’s main channel means it will get much greater exposure in the UK market. The show, which has been adapted for Greece, The Netherlands and Russia, is a top performer in Israel and has been greenlit for a second season. It follows the love story between a female celebrity and a baker who still lives with his parents. A chance encounter results in their romance, but the big question is whether their relationship can survive her jet-setting lifestyle, her overbearing agent, his unworldly family, both their exes and media intrusion. Elsewhere this week, there are reports that Sony PlayStation is cancelling superhero drama Powers after two seasons. The news was broken on Twitter by creator Brian Michael Bendis. The ‘at least for now’ may mean Bendis is planning to look for another network home for Powers. But the show has not been especially well received by critics, so a season three revival seems unlikely. At least Bendis can console himself with the fact that Powers will continue in comic book form with Marvel. Powers was PlayStation’s first original drama commission, so the fact that it has been cancelled may signal that the Sony-owned gaming platform is pulling back from investment in television. That wouldn’t be too much of a surprise given that Sony is now ploughing money into scripted productions for Crackle. Another show in trouble this week is Houdini & Doyle, which we have discussed before in this column. The show’s first season aired on ITV Encore in the UK and Fox in the US earlier this year, drawing modest ratings. Fox has now said it won’t recommission it, so it remains to be seen if ITV will go searching for other partners to keep the franchise alive. This week also saw the conclusion of The Secret Agent on BBC1. 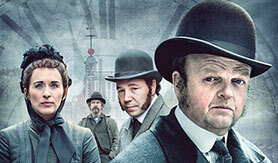 The three-part miniseries was an adaptation of one of Joseph Conrad’s finest novels. As far as I can tell, it’s the first Conrad TV adaptation since Nostromo in 1997. The Secret Agent itself was previously adapted as a film in 1996, with Bob Hoskins. I was very much looking forward to the production – because Conrad is one of my favourite authors and lead actor Toby Jones (Verloc) is one of my favourite actors. But it seems to have missed its mark with the audience. The first episode came in below the slot average, which doesn’t bode well for the next two episodes (the ratings aren’t in yet). It also scored just 5.8 on IMDb, which is low. And entertainment critics weren’t exactly enthusiastic. There appear to be two key problems with the show. The first is that the story is so bleak, a point well articulated by Gerard O’Donovan in The Telegraph. The second is that Conrad novels are not structured in a way that lends themselves to adaptation. So often in his works, key pieces of action happen early and then become the basis for extended psychological studies. This is very different, for example, from a Thomas Hardy novel – where there is usually a powerful setup, some unexpected twists and turns and a dramatic conclusion. The strength of the acting and writing certainly make The Secret Agent worth watching – it’s only three hours long, after all. But the show should be a warning to anyone thinking of adapting other Conrad novels. Those tempted should probably focus on his sea stories – and should perhaps look for a contemporary setting (echoing the way Francis Ford Coppola created Apocalypse Now from Heart of Darkness). Anyone interested in following up on this subject should see this Guardian article. 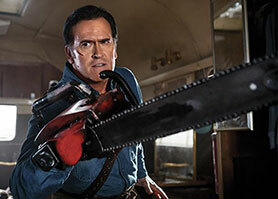 Finally this week, Starz Digital, the on-demand licensing arm of US cable network Starz, has licensed comedy-horror series Ash vs Evil Dead to Amazon in Germany. The first season of the show was a big hit for Starz in the US, reaching 8.7 on IMDb. Season two will hit US screens on October 2, while Amazon’s deal will see it air season one next month.